TD AmeritradeTD Ameritrade CEO Tim Hockey. TD Ameritrade last week rolled out a new offering allowing Main Street investors to place trades via Amazon’s voice assistant, Alexa. It’s the first instance of people being able to trade stocks through Alexa, TD Ameritrade said. The move comes as TD Ameritrade is trying to make trading more mainstream and pull in new clients. TD Ameritrade clients can now summon Amazon’s voice assistant, Alexa, to place trading orders, without calling a broker or tapping a button, the brokerage firm announced last week. It’s the first instance of people being able to trade stocks through Alexa, said Sunayna Tuteja, TD Ameritrade’s head of emerging technologies. 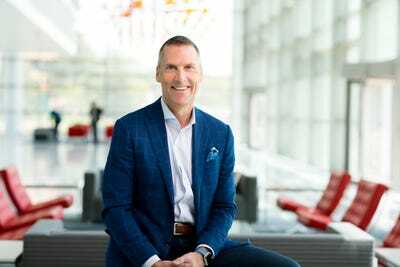 The move comes as TD Ameritrade is trying to make trading more mainstream – particularly among young, digitally savvy investors – in an attempt to pull in new clients. The firm already allows its 11 million Main Street investors to place trades via Facebook and Twitter. TD Ameritrade debuted an Alexa “skill” – verbiage for Alexa-compatible applications – in December 2016, enabling the virtual assistant to provide market briefings and stock quotes to users. But now it’s rolling out new features that allow Alexa to buy or sell stocks or exchange-traded funds, with a maximum of $US10,000 for a transaction. After verifying a numeric voice PIN, a user can tell Alexa to access their TD Ameritrade trading accounts, execute trading commands, and check position summaries. Alexa: What company or symbol would you like to trade? Alexa: That is Zynga Incorporated, symbol ZNGA, correct? Alexa: As of 12:43 p.m. Eastern Time, ZNGA is $US3.88 per share, down 1.9%. [The test trading account] has $US9.59 for trading. You want to buy ZNGA, right? Alexa: Do you want to place a market order or a limit order? Once the user sets the price and the number of shares they want to purchase, the virtual assistant places an open order and submits a confirmation. The user can examine the status of orders placed within 24 hours. The adoption of voice-controlled devices like the Amazon Echo and the Google Home is booming in consumer markets. A poll conducted last year and released by Gallup found that about 22% of US adults said they already used virtual voice assistants. And Amazon, which dominates the smart-speaker market, has sold about 50 million Alexa-enabled devices, sources who spoke to The Information earlier this year estimated. “When we were looking at the trends where the customers are spending their time and what technology they are using, Alexa was at the top,” Tuteja said. Other financial-services companies, including BlackRock, have indicated they’re considering using voice-controlled devices as well. Despite concerns that these devices pose security risks and can leave users vulnerable to eavesdropping and hacks, people appear increasingly willing to use them to manage their bank accounts – a recent survey by Bain & Co. found that over 25% of respondents said they would consider using voice-controlled assistants for their everyday banking, and 6% said they already did so.